In an effort to get my blog up to date, I’m going to do some short synopsis posts of our recent trips since life is about to change drastically in July with the arrival of our first child. The majority of the places we visited over the last 3 months don’t need long overviews anyway, as they were all quite small and pack a quick punch, rather than a 12 rounder. Again, I found a cheap plane ticket, so I figured we might as well take advantage of it….and off to Serbia we went. Not a country where probably 99% of the world would visit, but for any true traveler wanting to see everything the world has to offer, Belgrade is a must city to see. We headed in for a short weekend, which wasn’t too bad as Belgrade, the capital, is not that big. The old town area is quite nice, but is surrounded still of the destruction from the wars and violence in the past few decades. The ride into town is not memorable, and once again made me think “where the hell did I bring my wife this weekend?” But once you get into the city, especially the old town area, things start to turn. We stayed at a nice place right on the edge, called Townhouse 27, and used that as our homebase. The hotel was kind of a shock, as there are not many modern things in Belgrade, but this place was fitted with B&O components in each room, including a TV I had never seen before and the heaviest remote known to man, but let’s say the quality was high (it was). The first day we got there quite late, but we ventured out into town to find the main street where most of the shopping is. It was pretty dead, so we hit a small spot for dinner, and then crashed for the night. Next morning we were up and on our way. Got lucky with great weather, and started on Knez Mihajlova that was dead the night before. Not so much now, with all the shops open, cafe’s packed and street performers everywhere. 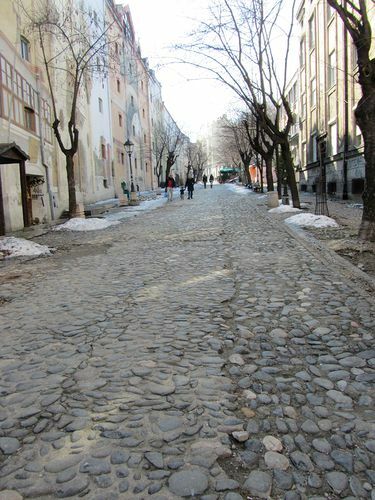 The street really connects all parts of Belgrade, as from one end is a bustling square, to the other end where the Kalemegdan Fortress is. 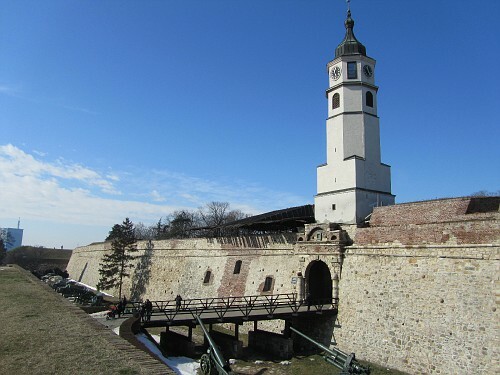 This area alone will allow you to see most of the main focal points of Belgrade. We also found that the locals like to snack, and snack a lot, on popcorn. There are popcorn stands everywhere, making old style popcorn and filling bag after bag. It’s cheap, it’s salty, and really good. It really looked like the whole town was headed to the movies at times. So we grabbed some popcorn, and headed over to the fortress. It’s huge, and sits right on the Danube, albeit not the prettiest part of the river, or the best view all around. The fortress is pretty intact for being so old, as it was built in 535 AD. They also had some tanks and weapons on display on the perimeter of the fortress which were from the World Wars, which I had no idea Serbia was even involved. 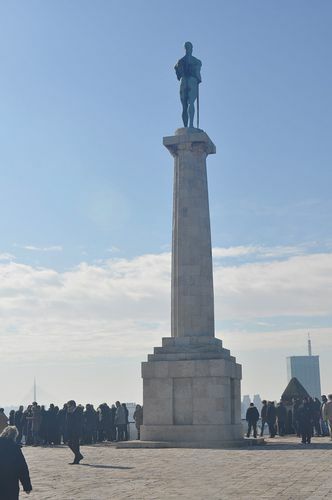 You also get to see the monument to “the Victor” while there, which stands on the corner of the fortress, and is the protector of Belgrade. If there was a place to find tourists in this town, it was around this monument. 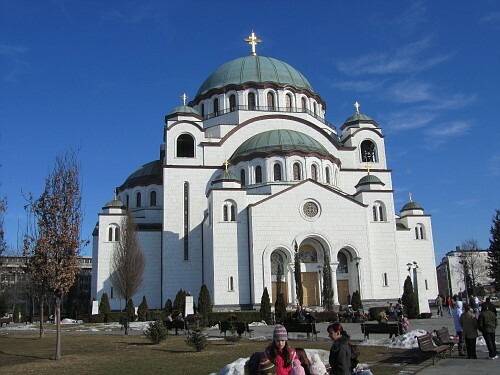 From there we actually made the trek to St. Sava Church, which is the largest Eastern Orthodox Church in the world. At present time, it’s under mass rehabilitation still on the interior, but should be done quite soon, and will be quite a sight. They don’t make them like this anymore, believe me. We then walked around the rest of the day, as the weather was great, and everyone seemed to be enjoying the day, since all the parks were flooded and the shops were buzzing. We then wanted to end the trip with a great dinner, and read about this place called Public, and it lived up to the hype and the reco. It is shoved back on a tiny, quiet street with a view over the river, is well let’s face it, not much of a view, but it didn’t matter. Had a great meal, with some local wine that was quite peppery, but that’s ok by me. All in all, I’ll be honest, I probably won’t be back to Serbia, but glad we hit Belgrade and saw what it had to offer. From the church to the fortress, to eating popcorn all day, I think it was a weekend well spent.